Many times we pretend to feel or act in a certain way to save face or to keep the peace with others. What we say, and what is going on inside of us, does not match up. When what we say and what is going on inside of us are not in alignment, we create a disconnect through our inability to communicate. At this point, trying to have any real interpersonal communication with someone will feel impossible. In fact, if this person is not an empath who can feel that your words and energy does not match, then they will take you at your word completely. This could cause them to assume that what you are saying is true, and they will expect you to behave as such. Now you are headed down a slippery slope, because every time you see this person or interact with them you have to pretend to be who they think you are. If the person that you are communicating with is a sensitive empath who can feel that what you are saying and what you are feeling does not match up, then you just lost their trust completely. They will most likely not be able to hold a conversation with you for too long, because you just activated their inner fire alarm warning them that something is wrong. Trying to connect with this person could be extremely difficult. Your reputation is at stake here, and you don’t want people to think you are rude? Right? It is not like you can go around telling everyone how they get on your nerves, now can you? What if you are simply a private person, and you don’t like to talk about your feelings all the time? What if you are mad all the time, but are ashamed to admit it? What if you know how the person will react to you so you are cautious around them and you don’t want them to know certain things? I understand, and all your concerns are valid, yet at the same time, if this is how you respond with most people in your life then your stress levels have to be through the roof. Eventually, you will get to the point where you are convincing yourself that you feel one way when you actually feel another. This is no way to live. You will never be happy in these types of conditions. You cannot possibly have a truly meaningful connection with someone when you can never fully be honest even with yourself. Why is it hard to speak your truth? Could it be that your need to please others keeps you stuck in this pattern? Most often we don’t speak up about what we want, what we need, and how we truly feel because we are worried about what the other person will think of us. If you are ready for that to change, then keep reading because I can help! If you feel angry or upset or even jealous towards someone, the first person you need to sort this out with is yourself. Take out your journal and have a conversation with yourself first. Allow yourself to feel what you are feeling in the raw. You need to determine if this is a conversation you need to have with the other person or if this can be resolved from within you. Sometimes we can resolve our emotions within, and therefore, resolve them completely. Other times, we need to involve the person we are feeling this way about. Start here, knowing what to do next, will come naturally. Determine if the person you feel you cannot speak your truth to is unhealthy for you any way. You have to really be honest with yourself here. If you cannot be yourself around them, you need to determine why. Have you tried to communicate with them in an honest and loving way and they dismissed you in the past? Is this someone that gets angry with you when you tell them what you need or when you say no to them in any way? Take the time to explore your relationship with this person and be honest with what you feel like you are running from here. Often times we say yes to things out of a feeling of obligation or fear, but not because we truly want to. You may even volunteer your time and services to please someone; to make them happy while you are simultaneously making yourself miserable. Be honest with yourself about the areas of your life you may be compromising to please others. When you stop saying yes to others only to please them, you have more time to do the things that bring you joy. Do you know what you want or how you really feel? How often do you find yourself feeling down or upset, but you cannot figure out why you are feeling that way? Take time to journal and ask yourself this question. “Am I being honest with myself about how I say I am feeling? Is there something hidden from me, or something I may be denying? Step #5 – Are you living in the past? To get to the root of this pattern, we may need to go backward in time. You could be operating on survival mode. Survival mode is when you feel like you have to do or say something to keep things from blowing up or causing major problems in your life. Is this a present situation, or something that has happened in the past? Is there something you need to let go of or someone you need to forgive? Journal about anything from the past that may be repeating itself in your current situations. Step #6 – Get clear about what your truth is! 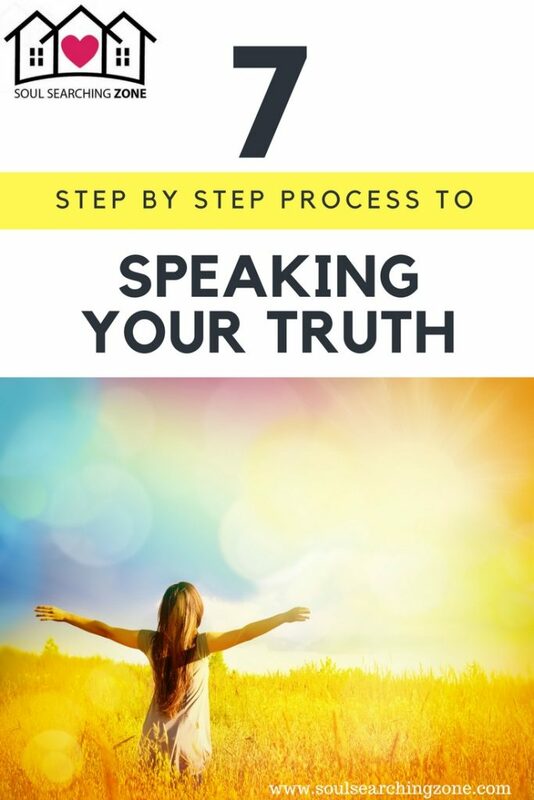 Step #7 – Speak your truth! Set your intention that you want to surround yourself with people that accept you for you. Honor your uniqueness and know that you will not fit in or be liked by everyone you meet and that is okay! Practice saying the word No. Practice saying how you feel in a loving way instead of holding back your truth. WOW!!! Nothing is by coincidence! I just read your artical, and it helped me so much! Thank you!